Nowadays, it’s a growing trend for people to use multiple SIM connections. But when it comes to high-end smartphones, most of them (such as iPhone) usually don’t support dual-SIM facility. As a result, either we end up ditching our favorite smartphone in favor of a dual-SIM one, or carry a secondary phone along to complement the primary smartphone. However, a few developers have come up with feasible alternative solutions to convert your single-SIM smartphone into a dual-SIM one. Here, we’ll explore a few of these solutions. What if you could somehow connect your two SIM cards together, and access services from both SIM cards from a single phone. Companies like MagicSIM and Simore are doing just that. The key idea is to use a thin, bendable metal strip that connects two SIM card holders. The Nano-SIM end of the hub is inserted to the phone’s SIM card slot, while the other SIM card holder can be attached to the rear cover of the phone by bending the metal strip around. This particular product is designed exclusively for iPhones, but can also be used in other phones with external SIM card slots. MagicSIM and Simore are two companies that manufacture multi-SIM adapters. While MagicSIM wraps around and attaches to the rear of the phone, Simore provides you with a separate case or cover which houses the extra SIM card slot. Both the SIM cards are attached to the phone and you don’t need to carry a separate phone or device. The secondary SIM card can be used for call, massaging as well as for internet surfing with easy 3G, 4G, LTE, GSM and other basic connections. But these products come with a few downsides. iPhone and other single-SIM phones are not capable of using two SIM networks at the same time, so you can only use one SIM card at a time. A small chip embedded in the adapter circuit switches the active SIM card depending on which one you want to use. The strip may take away some of the aesthetic advantages as it interferes with the phone’s design. So, if you don’t really want to switch the SIM card each time you need to call, text or use data packs, or don’t want to make your phone bulky, then there is another solution which comes from the developers of PIECE. PIECE is a gadget which allows you to use two active numbers in one phone. The product is basically the size of a standard ID card, though a bit thicker. It is also lightweight as well as pretty affordable, costing only about $50 to $60. PIECE accepts all GSM, PCS, DCS or EGSM cards. While you keep your primary SIM card in your phone, you need to put the secondary SIM card in the PIECE device. PIECE connects to your phone via Bluetooth 4.0 and provides an operating range of 10 to 15 meters between your phone and the PIECE device. You will also need to install the PIECE app on your phone, which allows you to manage and the secondary SIM features and turn your single SIM phone in a dual SIM one. 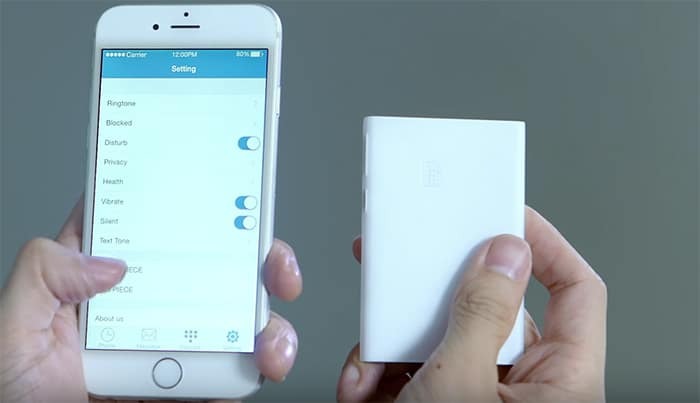 PIECE basically works as a secondary phone that operates through an app from the primary smartphone, over a Bluetooth connection. When a call or SMS comes to the secondary SIM, the app installed on your phone sends push notifications. From there, you can either accept or reject calls to the secondary SIM. Within the PIECE app, you get access to all the phone (dialer pad, call logs, etc.) and messaging options related to your secondary SIM card. So, you don’t need to switch your active SIM cards while using PIECE. At launch, PIECE is only letting you make calls and send text messages via your secondary SIM card. According to developers, data use from the secondary SIM may be included in the next version. However, you can always use the primary cellular network on your phone for mobile data. The product houses a built-in rechargeable 550 mAh Li-ion battery which will give you a standard 150 hours of standby time and more than 4 hours of talk-time. The product is compatible with both iOS and Android. There is another particular feature to sound a beep alarm, if it’s separated from the paired phone by more than 30 feet. Alternatively, the PIECE app on your phone also helps you to locate the PIECE device using the beer sound, if you can’t find it. Now you have a pretty good idea about how to make your Single-SIM phone into a Dual-SIM one. With these products around, you are no longer needed to carry two different Single-SIM phones. The dual SIM adapters provide you an affordable way to use two different SIM cards in one phone, with only one active connection at a particular time. Alternatively, if you want to keep both SIM cards active simultaneously, PIECE is the one product you should get.